The two-story, 4,000-sq.-ft. Pierotti House is the finest example of Neo-Classical residential architecture in the Fullerton area. Designed by Charles Shattuck of Los Angeles, the redwood-sided house features a diversity of architectural elements. Prominent among these are two pairs of fluted Ionic columns made from redwood, which support a richly detailed pedimented portico. The front balcony extends to the north to form the top of the porte-cochere. Palladian-style fans accent some of the windows, and the variety of bays and window arrangements contributes to the appearance of intricate detailing. The interior features rosewood paneling, ceiling beams and cabinetwork. The house was built with a cellar that still contains a coal-fired furnace to heat the rooms above. A portion of the gardens and orchard that were part of the original 40-acre ranch still surrounds the structure. As an important part of the overall character of the property, the grounds contain mature plantings, special garden areas, a sunken court, and some of the original orange trees planted by Mr. Pierotti. Mr. Pierotti commissioned Charles Shattuck to design and supervise the construction of the house. Mr. Shattuck was a prominent architect from the Los Angeles area for over fifty years. He is noted for designing several large business structures in Los Angeles, including several country clubs, the city's first produce market, and its first mausoleum. While the Pierotti House was under construction, Mr. Shattuck traveled from Los Angeles at least once a week to the property to monitor personally the progress. The Pierotti family was one of the earliest to settle in the Fullerton-Placentia area. Attilio Pierotti played a key role in the development of organized packing, shipping, and marketing of the citrus from the area. Born in Lucca, Italy in 1857, he came to the United States in 1874, and settled in Orange County two years later. By 1909, he had acquired 40 acres of land and had enjoyed enough success in the orange-growing business so that he was able to build his two-story house for his wife, Jane, and their four children. Mr. Pierotti was actively involved with the business affairs of the community for many years, and his wife promoted many cultural activities of the era. Their house was used frequently to entertain prominent local persons and friends from Los Angeles, where the family had social connections. 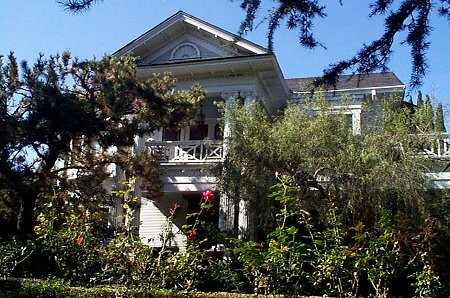 Although now nearly hidden from public view behind fencing and high shrubs, the house and grounds are an excellent example of the beautifully landscaped homes of Orange County's prominent orange ranchers who gained their fortunes from the late 1890s through the 1920s. Today, the remnant .9-acre property is still owned and used as a residence by the Pierotti family.